The only place for restraints inside of a nursing home is where a patient would be likely to cause him or herself bodily harm or to do harm to others. Unfortunately, many nursing facilities use physical and chemical restraints as a means to subdue more difficult patients or as a means of discipline. The nursing home abuse attorneys of Nursing Home Law Center LLC firmly believe that this is an abuse of power and that nursing homes that resort to these methods with no good reason should be held accountable for their actions so that others will be forced to change their ways in order to avoid similar consequences. If you believe that your loved one suffered an injury or death due to a physical or chemical restraint in a nursing home, you may be entitled to pursue a lawsuit against the facility. Get more information and consult with a lawyer for free here. Chemical restraints are medications that are administered to patients with the purpose of altering their behavior or state of consciousness. They are primarily sedatives or antipsychotic medications that calm patients who pose a risk to themselves or others. Federal laws have made it clear that these medications are to be strictly used as a last resort and only if absolutely necessary. Many of these medications can have severe side effects and may interact with other medications. 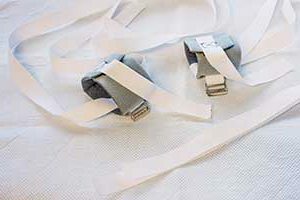 Following are the different types of chemical restraints our nursing home injury lawyers have seen used in an illegal fashion. Antipsychotics — these medications are the drugs most commonly associated with the term “chemical restraints” and include droperidol, haloperidol, risperidone and olanzapine. They are used to treat anxiety and to calm patients experiencing mania or psychosis, but their side effects can include fatal heart conditions and other serious conditions. Most of these medications come with warnings and it is recommended that they be used with extreme caution. Benzodiazepines — this class of medication includes muscle relaxers and sedatives used to normally help patients suffering from panic attacks or insomnia. The most common medications in this class used in nursing home settings are lorazepam and midazolam. Dissociative anesthetics — the way that these medications work is by placing the patient into a hallucinatory state where his or her perceptions of sight and sound are altered. They essentially impair the ability of the patient to be able to associate with reality and are used far less frequently than other forms of chemical restraints. The improper use of chemical restraints has been linked to over 15,000 nursing home deaths each year and nursing facilities need to be held accountable when their staff members so egregiously disregard the will of their patients or their legal representatives. It is important to understand the law in regards to chemical restraints because it heavily favors the patient at this moment in time. The only circumstances in which a nursing home may chemically restrain residents are in the event of an emergency or when the patient has been prescribed the medication by a licensed doctor. The prescription needs to be written in such a way that it is clear how long the medication is to be used and what the exact circumstances surrounding its use are to be. Most importantly, no patient may be given these medications without consent. Patient consent will always supersede a doctor’s recommendation. If the patient is unable to make the decision for him or herself, a legal representative may decide on his or her behalf whether chemical restraints are to be used. The decision made by the patient or representative may not be overruled by the nursing home or a doctor. Some caregivers may choose to physically restrain a difficult patient. Unless the patient poses a risk to him or herself or to other people, however, it is not ethical or lawful for physical restraints to be used. It is common for abusers to pair the use of physical restraints with physical or sexual assault and for caregivers to threaten or verbally harass the patients that they restrain. Many nursing facilities will use restraints as a means of controlling patients or as disciplinary measures. Patients who are restrained may also be subject to verbal or emotional abuse and afraid to come forward due to the issuance of threats by the caregivers placing them under restraint. The use of restraints may make it easier for nursing homes to control their more difficult and volatile patients, but it is illegal to use restraints in this manner. Only when a patient has been proven to be a threat to him or herself or others can restraints be used. When visiting your loved one, take note if you notice any marks on his or her wrists or ankles, as these are the most clear physical signs that he or she is being physically restrained. It may be more difficult for you to detect when he or she is under chemical restraint, but you will be able to tell primarily by changes in his or her mood or behavior. You may notice that your loved one appears groggy, goes through mood swings or appears emotionless. If you have any concerns about whether medications are being used in an illegal manner to subdue him or her, seek the advice of a legal representative immediately. Nursing Home Law Center LLC has been representing the interests of clients across the country area for many years and has helped countless individuals and families find the justice and compensation that they deserved when they were injured due to the negligent deeds of others. Our special nursing home abuse legal team has specialized knowledge and experience working with cases similar to your own and can help you determine whether your loved one is being mistreated and what to do about it. We even that the resources you will need to move your loved one into a new home that will provide the quality of care that he or she truly deserves. Contact us today to arrange a risk-free consultation with one of our award winning nursing home negligence attorneys and we will gather all of the information we need to launch our own independent investigation into the matter. Once we have determined the facts in the matter, we will let you know more about the law, your rights and the legal options you have available. If we are unable to secure compensation on your behalf for any reason at all, you are assured that our services will cost you nothing at all.